Adding a name or monogram to a room is a great way to personalize it. 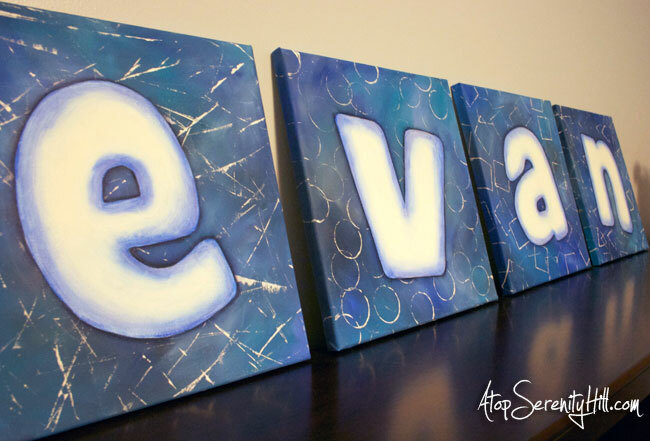 I painted these letters on canvas for a friend and wanted to share the tutorial with you! 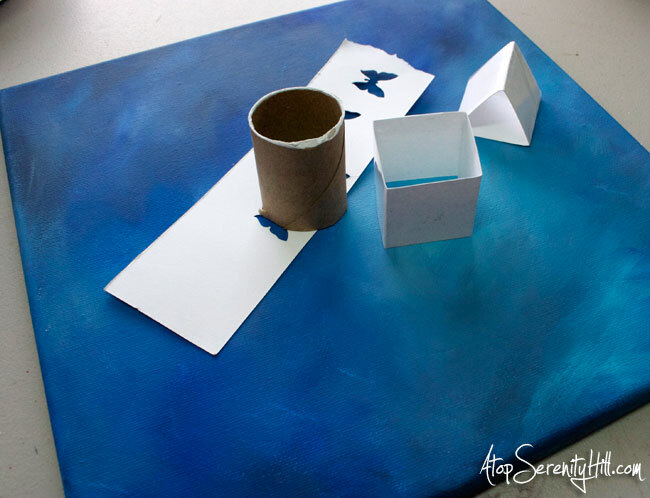 I started with a set of 12″x12″ stretched canvases and FolkArt craft acrylic paint in a variety of blues. 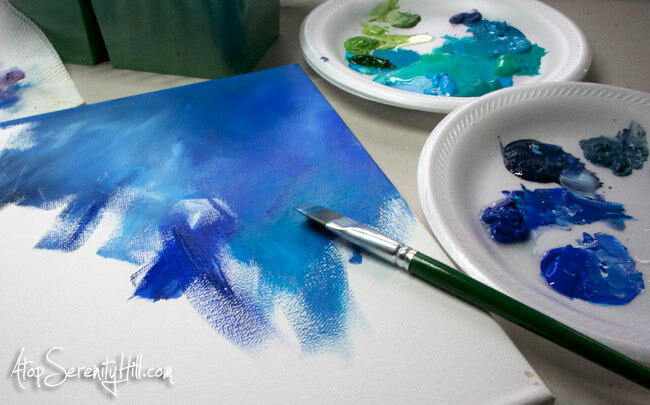 Using a large flat brush, I randomly picked up the blue paint and slip-slapped the colors on the canvas. I worked pretty thick with the paint and fairly fast as I wanted to be able to blend the colors together as I went. I used the same colors on all 4 canvases but because I was so random about which blue I picked up, each canvas had a slightly different color pattern. I also decided to add another layer of color to the design and choose to use some basic shapes…line, circle, square, triangle. I used posterboard, packing tape and a cardboard tube to form the shapes. 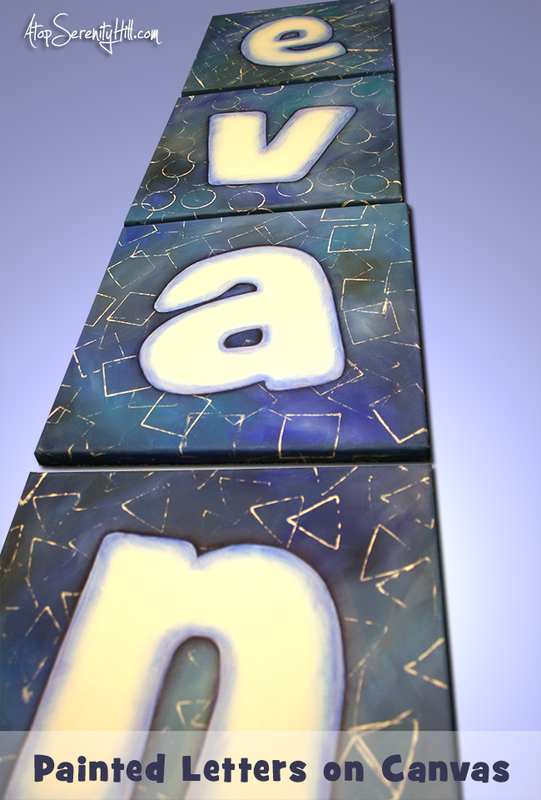 I dipped each shape in white paint and then added the second layer of pattern to the canvases. Since I had painted the edges as well, I made sure that all the shapes carried over onto the sides. The patterns for each letter were made with my Silhouette machine and card stock but you could easily print them out and use scissors with the same result. 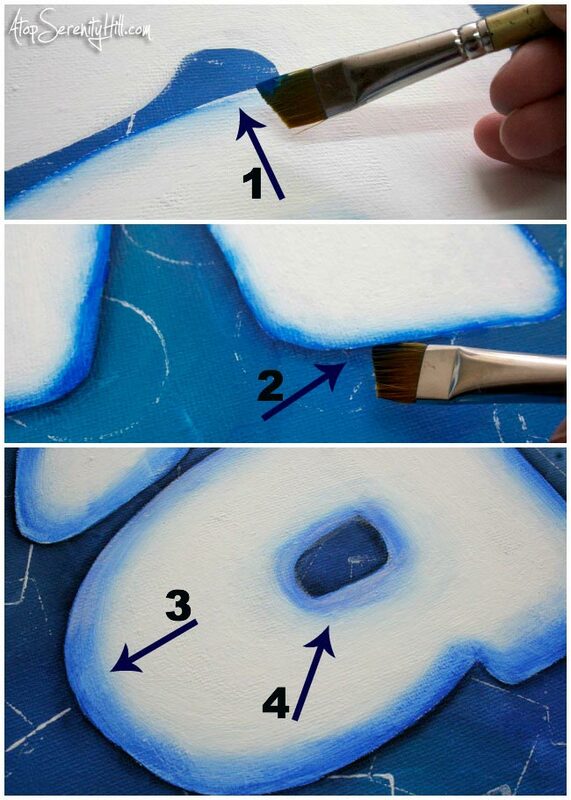 I traced on each letter with white chalk and base coated them in with white paint (it took 2 coats to cover the blue). The next steps were to shade the letters. If you are familiar with decorative painting terms, then you would basically be floating the shade color on each letter. If the term floating is not familiar, here’s what I did. I used a 1/2″ angle brush with a light blue in the point (toe) of the brush and water on the other end (heel). This created a soft gradation of color from light blue to no color. I ran the toe of the brush along the inside edge of each letter. You’ll need to pick up paint and water fairly often to keep the look smooth. I used the same technique in step 1 with a dark blue and went around the outside of each letter to make it stand out from the background. I then realized that what I had painted in step 1 was too thin. So I repeated step 1 with a 1″ angle brush to create a larger inside shadow. Once I was happy with that, I use the 1″ angle brush to add a wash of white paint over the inside shadow to soften the effect. This is a perfect example of learning what works best as your project progresses. Steps 1 & 2 were planned for the design I had in mind. Steps 3 & 4 happened because what I had planned didn’t work right. But that’s the great thing about acrylic paint! Just let it dry and paint over it…problem solved! 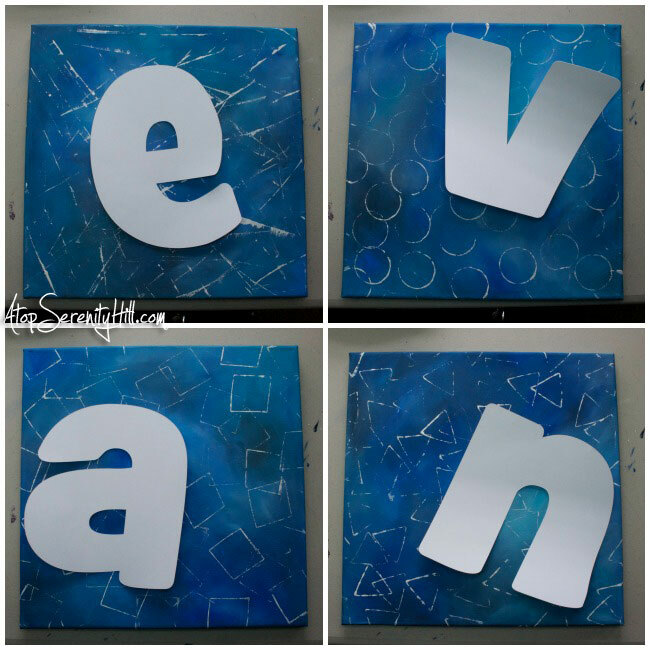 These DIY painted letters on canvas make a great addition to a fun little boy’s room! And they have the added bonus of helping to teach him how to spell his name. The canvases work great together but just a simple monogram would be a colorful addition to your space. Thanks for the lesson. You gave me lots of ideas though I’m not sure about the heel and toe of the same brush. Good morning. You are welcome, Barbara! Angel brushes can be a bit confusing. They literally have a long side and a short side. The long side is referred to as the toe and the short side as the heel. Hope that helps some! These are too cute! I love your pics btw! Stopping by from the Sits Girls linkup party!! Thanks, Emily! I love taking pictures for the blog. That is half the fun of doing the project. This is so cool! I’m going to give this a try for my craft room! Thanks for sharing. While I’m not a crafty gal, I love other’s creativity. Well done…pinned! Thanks, Patti! Have a fab weekend! Thanks, Kelly! Have a great week.